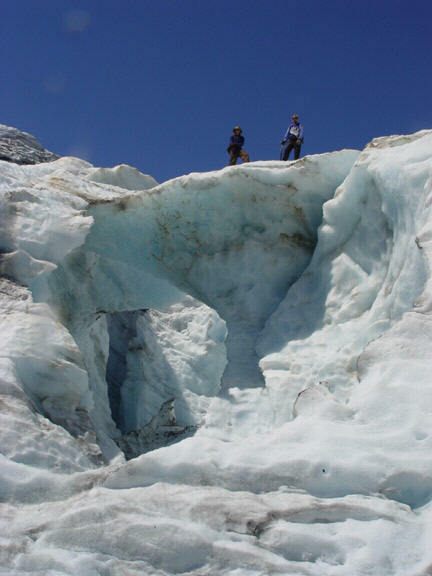 During August 2005 Tom Hammond of Seattle, Will Wright of WWU, Mauri Pelto and Ben Pelto from Massachusetts spent several weeks observing North Cascade glaciers. 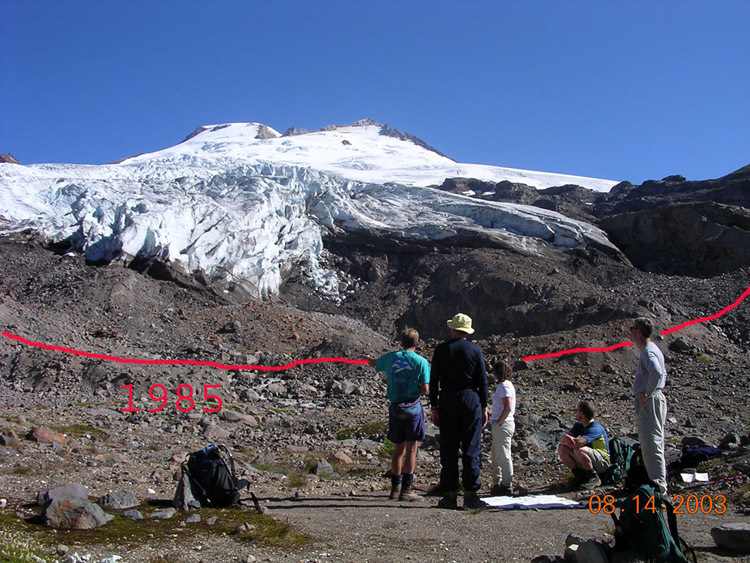 This was the 22nd consecutive year that the North Cascade Glacier Climate Project has observed North Cascade glaciers. The program purpose is to identify the response of these critical glaciers to ongoing climate change. What follows is our experiences and observations. Columbia Glacier 8/1-8/3: The Columbia Glacier sits in the Monte Cristo Peaks. It is the largest low altitude glacier in the range its head at just 1750 m and its terminus at 1450 m, with an area of 0.9 km2. Monday was the only day it rained outright for the entire two weeks. And even then it was mainly over by mid-morning, and clear enough by mid-day to allow us to do the full suite of measurements slated for the day. The only problem was, there is nothing to measure. There is literally NO SNOW on the entirety of the Columbia Glacier save for a couple of pockets along avalanche fans, and even then, the snow there average 2.5 meters less than normal. The resultant mass balance will be close to a 3 m loss in mean glacier thickness, which is a substantial negative mass-balance, for a glacier with a thickness averaging about 70 m. Combined with losses of over 3 m in 2003-2004, 10% of this glacier has been lost in 3 years. As we approached the Columbia, we immediately noticed the glacier had retreated significantly in only one year! Where there had been ice more than 10 feet thick in 2004, now there was an olive-drab lake. The glacier has retreated some 30 meters IN ONE YEAR. 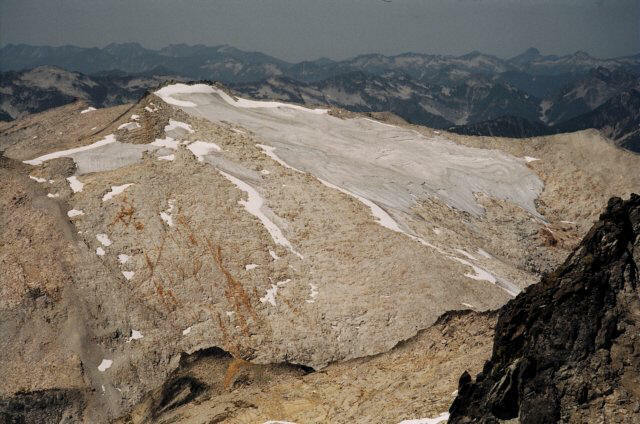 Note bare glacier ice exposed on 8/2/2005 compared to considerable snow cover in another bad year 8/2/2004. Alpine glaciers typically have three zones: ablation (at the bottom where melt exceeds snowfall), firn (this is the “equilibrium area” where snowfall and melt are balanced, and is often called the equilibrium line), and the accumulation zone (where the food of the glacier is–snowfall exceeds melt). It is accepted that most glaciers will retreat to their new equilibrium areas as the planet warms; but in the case of most all glaciers in the North Cascades, this line of “equilibrium” is ABOVE the top of the accumulation zone. That is, there is no equilibrium for most of these glaciers to retreat to–they are doomed. Thus, the glaciers are in disequilibrium, and cannot achieve equilibrium or even survive. These glaciers can be identified by the fact that they thin as much in the accumulation zone as at the terminus. The only glaciers observed this summer that are not in disequilibrium are the Easton and Rainbow Glacier on Mount Baker. Some of the glaciers in disequilibrium like the Columbia are thick and will take some time to melt out. Note the regular white surface of the snow from 2004, and the complete lack of snow, and annual layers evident in 2005 in the pictures at the top of the page. This is the first time in 22 years that the glacier has been in this state. The snowline in early August is usually close to 6000 feet but this year it was nearly 7000 feet. At 8000 feet the average snow depth was 3 meters versus the norm of 5.0 m. Easton Glacier lost 2.5 m and 30 meters in length. Total retreat since 1990 is 250 meters. The hike in was easy and fun, as the wildflowers and berries were everywhere, and the vistas great as well. From more than a kilometer away, we immediately noticed a large scalloped area at the W. terminus that was ice last year, and is exposed rock now. Perhaps 75 meters across, it was rather shocking to see. Then we noticed a football-field sized area of a serac field on the E. side, closely above the terminus, was no longer ice. It was sobering. The days were sunny and warm, and the surface streams in evidence. Indeed, this would be a theme repeated on all of the large glaciers with gradient to them: plenty of water rushing along the surface, carving the glaciers up and creating impressive serpentine channels. At times the water would pool, forming small ponds on the surface. Sunday morning found us on the Ptarmigan Ridge trail, a scenic hike along high alp slopes. It is a very popular hike, as it starts above 5,000′, and this sunny, hot weekend found many people on the trail. Sadly, quite a few had dogs with them, so the chances of seeing wildlife were pretty much reduced to zero. It was amusing to hear confused comments about why there wasn’t more wildlife, when the answer was barking at them the whole time. Once the day-hikers and their pets left, and we had hiked beyond most of them the wildlife did come out. Indeed, we saw no less than 41 goats on Monday, including 11 or so that wandered right in to our flowery camp early in the morning and woke us up with their playful kicking, and munching of the succulent plants. We surmised that the population is so large due to the lack of real winters each of the past three years, reducing mortality. Sunday afternoon was spent measuring one of the pocket glaciers on Ptarmigan Ridge that was adjacent to camp. This glacier had retreated over m since 1984.
day in the mountains. You see, Monday was 11.5 hours of hard, circumnavigating the Sholes and Rainbow which with minimal snow forced us to wear crampons for all but one hour of the day. Near the terminus, we happened upon a feature never before seen by any of us (and that’s saying a great deal in Mauri’s case). Here surface rivers and rivers flowing in the middle of the glacier combined to carve out what we dubbed “The Grand Canyon” in the ice. A huge chasm, some 28 meters from top to bottom, and even longer on the axis of flow, was cut in the ice. Surface streams entered in a dramatic display of waterfalls from above, other streams appeared right out of the ice walls to add to the flow, and carved out of the middle was an arch of deep blue ice overlooking the whole thing. We ate lunch here, and marveled at the wonders of the world. This HUGE feature had not been present the year before–not even close. 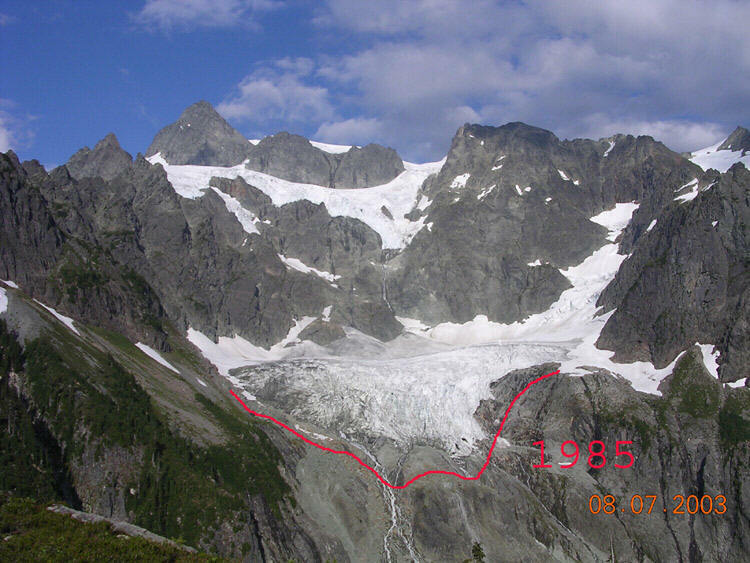 The terminus of the glacier had retreated 350 m from 1984-2005. We then ascended up the glacier including an icefall to reach the head of the glacier at 6600 feet where 3 meters of snow remained, better but not the normal 5meters expected. 8/10: The Lower Curtis Glacier was next and it had very little snow, and none that would see the end of the summer. Again a first for this dynamic glacier. The terminus remains steep, active, crevassed and retreating as seen below. This glacier will lose about 3 meters of ice thickness this year. 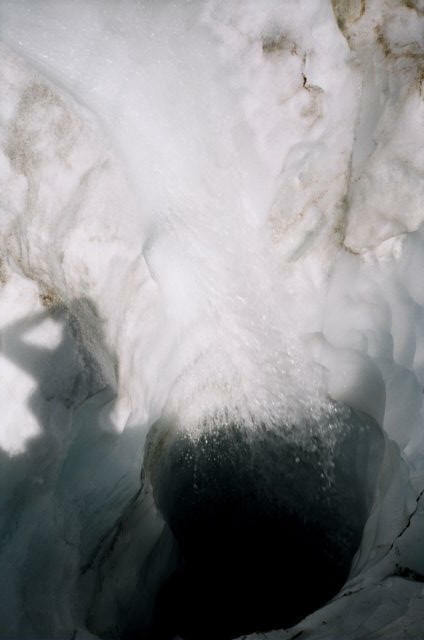 The river draining from the terminus has opened a cave at the southwest corner of the glacier. 8/11:The Cache Col Glacier had snow depth maximums of 2 meters right near the col instead of 2meters of snow 100 meters above the terminus. This glacier will be bare of snow by 9/1. The terminus zone is not nearly as crevassed and had retreated 15 m since last year, which is significant for a small glacier. Ice Worm (Hyas Creek) sits on the E. slope of the E. peak of Mt. Daniel. 2100m-1900m, area about .1 sq km Like the others, the Ice Worm has lost quite a bit in a year. Indeed, it has retreated more at the top of the glacier 140 meters in the last 13 years then at the bottom 120 meters. Overall this is 35% of the glacier length gone. The glacier still has considerable thickness in the cirque as shown by deep stream channels, up to 18 meters. This glacier also has a new lake at the terminus. Daniel Glacier sits on the NE slope of Mt. Daniel and marks the headwaters of the Cle Elum River. 2230m-1970m <-(not any more), area .4 sq km How sad. The terminus is literally a mere shell of what it once was. The lower 20% of the glacier is a thin veneer of ice suspended over the rock. By the time you read this, the Daniel Glacier will literally have lost about 10% of it’s area, as this thin ice melts out. It made for some REAL dangerous travel, as we’d be walking on seemingly solid ice and then there’d be this weird hollow sound to our footfalls. We were in a mine-field of thin ice, close to breaking through and dropping several meters onto hard rock. 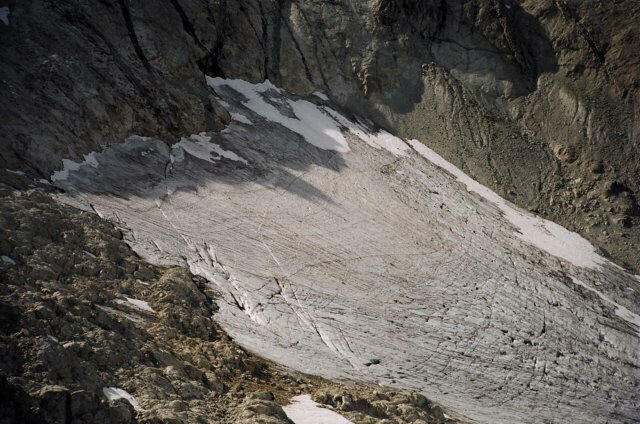 This glacier is still in better shape than the Foss Glacier on Mount Hinman, seen below that has lost 75% of its area since 1992 and is very thin and doomed. As more rock becomes exposed, it absorbs more heat resulting in even more melt. Lynch Glacier was the only glacier with any snow that will endure the summer on Mount Daniels. Snow depths were 3 to 4 meters above 7500 feet. The glacier has divided in two as a ridge has melted out just west of the center of the glacier. Retreat on the west half of the glacier is tremendous in the last three years averaging 25 meters per year. The thicker more active eastern half is retreating much more slowly. The eastern half is between two of Daniels peaks and this protection results in very high accumulation right on the Cascade Crest. The glaciers had the poorest snowpack in the last 22 years and probably 50 years. The loss in mass over the 22 years amounts to 11 meters in mean ice thickness lost from glaciers that averaged 50 meters thick. That is 20% gone in 22 years. May the snow gods be kinder this coming winter.